In effort to create precise measurements of individuals of The Revelation Painting, the study of human bone structure lead me to Forensic Anthropology. It is imperative that I understand the measurements and calculations required to create the correct perspective of various races of human beings. This study became extremely important in The Four Horsemen scene previously mentioned. Based on Forensic Anthropology’s scientific calculations, the length of a man (or woman) can be measured by several bones for a relatively accurate overall height. I used the length of the average Caucasoid male to calculate the total height and verified by art anatomy standards. With those two techniques applied I have calculated the height of the white horses’ rider to be 5′7″ based on his position in the painting. Length of the femur (16″ or 2 heads)X 1.88+32=5′7″. Now I am able to calculate the height of all riders not only based on their position and perspective, but also the base calculation of the white horses’ rider! Therefore, all measurements will be scientifically correct. The face of the rider will be designed around the general skull shape. This is what lead me to discover the calculations required for accurate perspective in this massive design. The bottom of the sketch exhibits the “general” layout of the horses’ areas in this scene. In the upper left the white horse was estimated by the size of the area it will occupy, then sketched loosely to get an idea of the head size, as noted by the numbers to the left 1-4 (which are in feet then unmarked in inches-estimated). 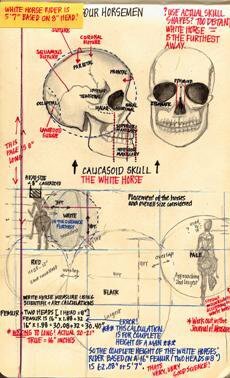 The entire page length of this sketch was surprisingly 8″, the exact size of the skull. This gave me a raw look at the size of the head which is close to actual human size. The white horse is the furthest back in the painting…he is receding. By looking at the size of the black horses’ space and that he is the closest to the viewer, he and his rider will be over 9′ tall…IMAGINE! I produced an error in the initial calculations. 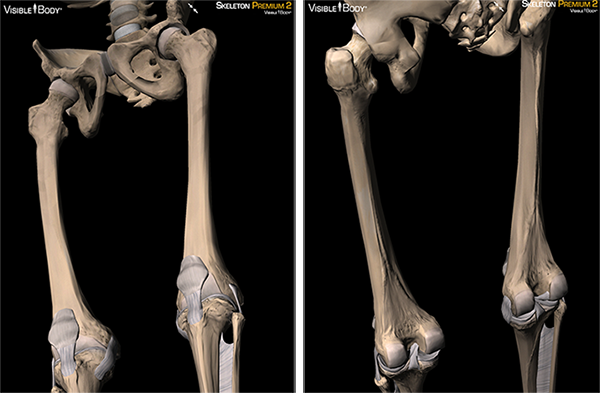 I was under the impression that the scientific calculation made the length of the femur itself and calculated initially on that finding (in black), then I “saw the light” (in blue) and correctly calculated the length. Through my research, ancient men used to be shorter in stature than they are now in modern times, so his total height is most likely correct for his time.